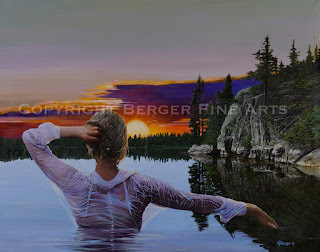 This image depicts a young woman watching soaking in the view from the best spot on the lake and that is actually in the lake somewhere in the Northern Minnesota boundary waters. If you look carefully there is more than one person in this image. This young woman has just taken notice that she is not alone on the lake and she stops and tries to focus her eyes on something but she is not quite sure if it is really there. For a hint the title of this painting is "Lake Maiden's" for a reason. The magic of the boundary waters colors early or late in the day are really magical and I was trying to capture that unique combination of light and reflections that sometimes trick your eyes into seeing things that may or may not be there. This 48" x 38" original acrylic painting was a lot of fun to do. Prints are available now. It's near the end of July and the corn is well above knee high. This acrylic painting is titled "I See You" and measures 30" wide by 36" high. 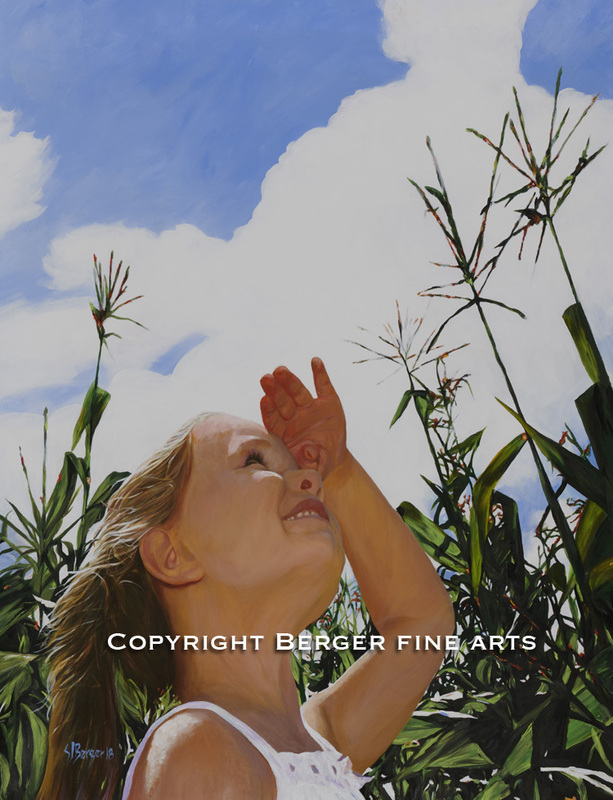 This little girl is looking up trying to see above the corn crop surrounding her. It could be a soaring hawk or maybe something taking shape in the clouds. With this painting I wanted to bring a smile and a bright sunny day every time this painting is viewed at any time of the year. Prints of this image are available.